The 2007/08 Premier League campaign proved to be a landmark one in many ways. 'Premiership' was dropped from the competition’s title and the league would top the UEFA Club Co-Efficient for the first time after Manchester United and Chelsea contested the first all-English UEFA Champions League final in May 2008. United won on penalties and the title race would also go down to the wire as Sir Alex Ferguson’s side looked to defend their crown. The 'big four' of United, Chelsea, Arsenal and Liverpool had led the way in the previous two seasons, and each of those sides strengthened in the 2007 summer transfer window. Owen Hargreaves, Nani, Anderson and Carlos Tevez were the marquee additions for United, Florent Malouda joined the Blues, Liverpool brought Atletico Madrid striker Fernando Torres to Anfield and Arsenal bolstered their strikeforce with Eduardo, after their all-time top scorer Thierry Henry departed following eight years in north London. Despite Henry moving to Barcelona, striker Emmanuel Adebayor quickly stepped up as Arsenal won eight of their opening nine Premier League matches. The Togo international scored twice, including a magnificent flick and volley, as Arsenal triumphed in a 3-1 victory over north London rivals Tottenham Hotspur at White Hart Lane on 15 September. Only five days later, Jose Mourinho parted company with Chelsea after picking up 11 points from their opening six matches. He won two Premier League titles during a hugely successful first spell as manager at Stamford Bridge and was replaced by Avram Grant. The Blues suffered a 2-0 defeat by Man Utd in his first match in charge. September also saw Portsmouth and Reading contest the highest-scoring match in Premier League history. 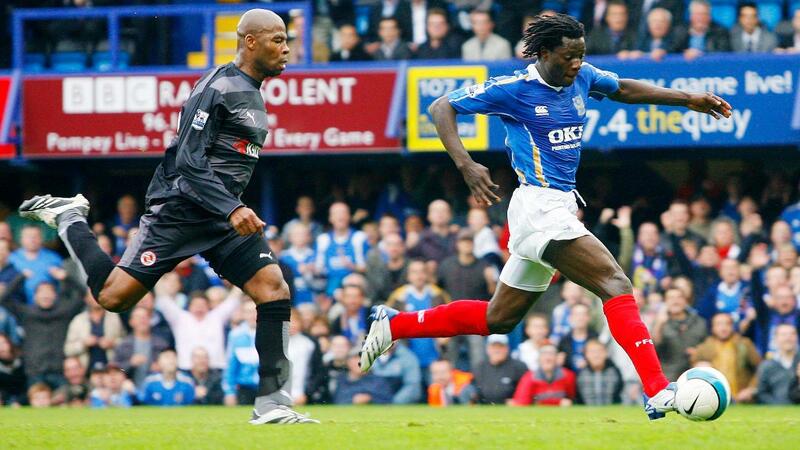 Benjani scored a hat-trick as Pompey won 7-4. Harry Redknapp's side briefly moved up to fourth in the table with a 4-1 thrashing of Newcastle at St James’ Park in early November. That match signalled a decline for the Magpies, who won two of their next 11 matches, and they replaced manager Sam Allardyce with Kevin Keegan in January 2008. It was Keegan's second spell in charge, 12 years after narrowly missing out on the Premier League title in his previous reign at St James’ Park. At the turn of the year, Arsenal led the way after just one defeat from their first 21 matches. They were closely followed by United, who were inspired by the form of top scorer Cristiano Ronaldo. The Portuguese winger scored a dipping, swerving free-kick past the helpless David James, who surpassed 500 Premier League appearances during the campaign, in their 2-0 home win over Portsmouth to go top on goal difference at the end of January. Arsenal regained the advantage when Manchester City beat rivals United at Old Trafford for the first time in 34 years on 10 February. The match was on the 50-year anniversary of the Munich air disaster and, on an emotional occasion marked with a floral tribute and special kits, Darius Vassell and debutant Benjani secured the visitors' win. With the Gunners in the ascendancy, a 2-2 draw away at newly promoted Birmingham City, which was marred by a broken leg for Arsenal striker Eduardo, swung the title race in United's favour. James McFadden scored a stoppage-time penalty to level the match after Theo Walcott had scored his first two Premier League goals to put Arsenal ahead. That was the start of a run of one win in eight matches for Arsene Wenger's charges. Since a 2-0 defeat by the Red Devils at Old Trafford, Chelsea had lost just once in the Premier League and they put themselves firmly in the title race when they won the reverse fixture on 26 April. Michael Ballack's double put them level on points with Man Utd, but it was the defending champions who went on to lift the trophy after winning their last two matches. Ryan Giggs' calm finish sealed a 2-0 triumph over Wigan Athletic on the final day and he lifted his and Manchester United's 10th Premier League trophy. Ronaldo scored his 31st league goal of the season in the win – a joint-record in a 38-match campaign. On the same day as Chelsea's 2-1 win over United, Fulham started one of the greatest escapes from relegation in Premier League history. They were five points adrift of safety with three matches left and were 2-0 down at Man City with 20 minutes remaining. On the brink of the drop, Diomansy Kamara and Danny Murphy levelled the match at the Etihad Stadium before Kamara struck again with a last-gasp winner. Fulham then beat Birmingham at home and secured their safety when Murphy's header sealed a 1-0 win against FA Cup winners Portsmouth on the final day. Reading went down on goal difference despite a 4-0 rout of already-relegated Derby County, who amassed a record-low of 11 points during the Premier League season. Birmingham were also consigned to the drop, even though they beat Blackburn Rovers 4-1. The final day also saw Middlesbrough thrash Man City 8-1.